An Airman prepares a slide in the in the hematology laboratory section of the Mike O’Callaghan Federal Medical Center at Nellis Air Force Base, Nev., April 24, 2017. Even though each section in the Clinical Laboratory is specialized in the tests they perform, all of the lab sections work together to provide the best patient care. Medical Laboratory Professionals Week, that ran April 23 through 29, is an annual celebration that recognizes the extensive training lab professionals go through and the critical role they play in disease diagnosis and prevention and in supporting our goal of Zero Harm. 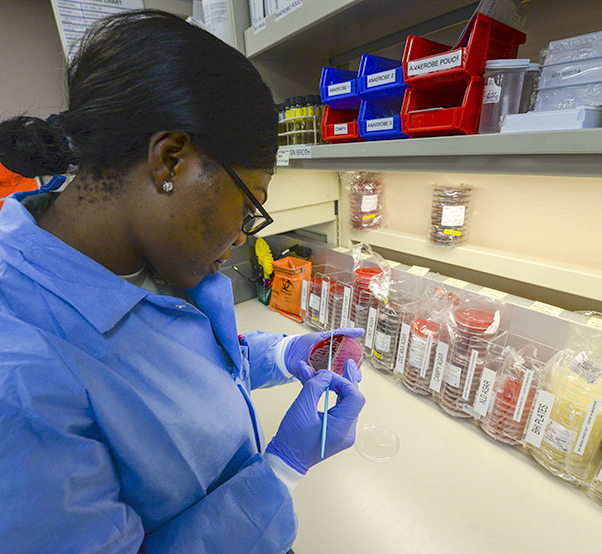 The week also provides an opportunity to highlight the men and women of the 99th Medical Support Squadron Clinical Laboratory and the important role they play in healthcare and mission readiness here. Often the dedicated efforts of laboratory professional goes unnoticed. The Clinical Laboratory is vitally important. Even though patients may see only a few lab techs, there are many more working behind closed doors ensuring that patients receive excellent medical care building a High Reliability Organization. 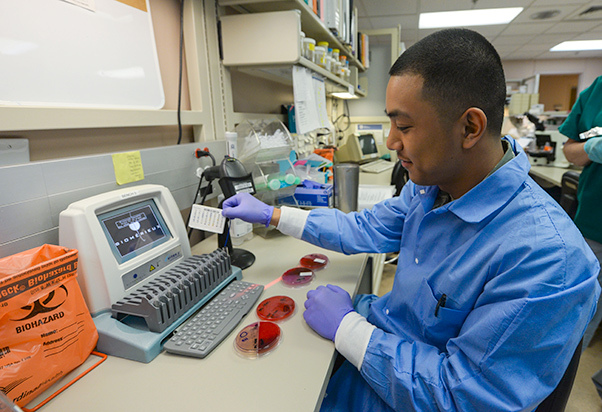 Senior Airman Daniel Demayo, 99th Medical Support Squadron laboratory technician, inserts an Anti Susceptibility Card into a Vitek2 machine in the Microbiology section of the Mike O’Callaghan Federal Medical Center at Nellis Air Force Base, Nev., April 24, 2017. Medical Laboratory Professionals Week provides the profession with a unique opportunity to increase public understanding of and appreciation for clinical laboratory personnel. * Core Lab: contains the chemistry, hematology, coagulation and urinalysis sections. Lab technicians perform a variety of tests in these sections including glucose, cholesterol, Coumadin checks, complete blood counts, and several more. * Microbiology: identifies bacteria, viruses, fungus and parasites. * Blood Bank: provides patients with much needed blood products in an emergency or during surgeries. Identifies antibodies and other clinical conditions that could cause harm to the patient when receiving blood products. * Anatomic Pathology: prepares and examines tissue to determine if a disease is present. Even though each section is specialized in the tests they perform, all of the lab sections work together to provide the best patient care. 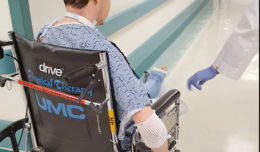 The lab operates around the clock to make sure that the patients’ needs are met and to assist the provider teams with any test that they might need done to help diagnose the patient’s condition. 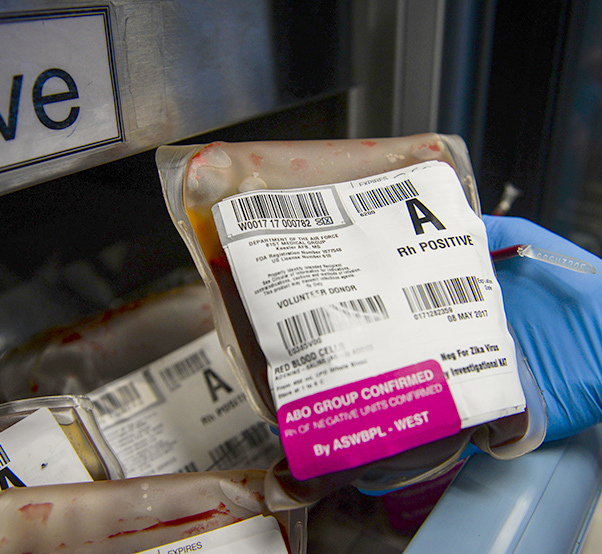 Senior Airman Jessica Tamuzza, 99th Medical Support Squadron laboratory technician, pulls a bag of A positive blood from the blood bank in the Mike O’Callaghan Federal Medical Center at Nellis Air Force Base Nev., April 24, 2017. The blood bank provides patients with much needed blood products in an emergency or during surgeries. The 99th MDSS laboratory professionals deliver accurate testing on a daily basis and serve as a part of the installation’s health care team. By using state-of-the art technology and instrumentation helps the detection of potential health problems. The sooner a disease is caught, increases the changes for a positive outcome. Seventy percent of medical decisions are based on laboratory testing results. As part of MLPW celebration, 99th MDSS has several activities planned to further recognize all the hard work the lab technicians put in day in and day out. Airman 1st Class Shutyame Maryl-Lisa, 99th Medical Support Squadron laboratory technician, holds an agar plate at Nellis Air Force Base, Nev., April 24, 2017. 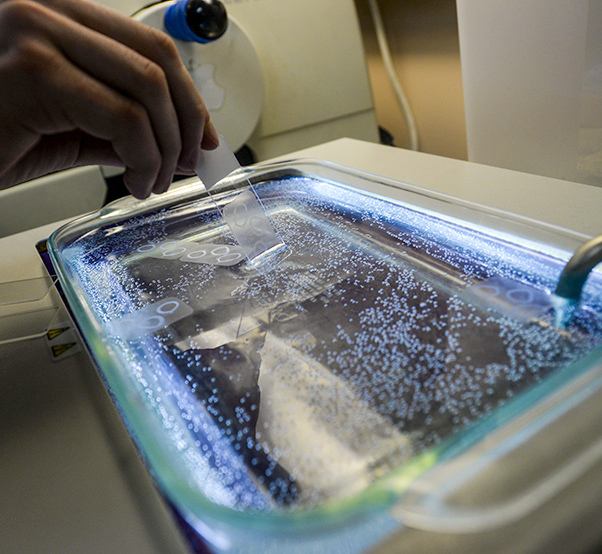 The Microbiology section of the lab tests patients for infections caused by bacteria, fungi or parasites. Many types of specimens including blood, urine, stool and others are tested. According to Robinson, a few of those activities include several lab themed games, team building exercises, Ultimate Frisbee, potluck and a BBQ social to end the week.